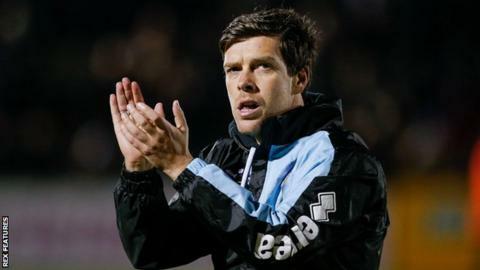 Bristol Rovers manager Darrell Clarke has said he is wary of handing out long-term contracts to his players because it may hinder performances. The majority of Clarke's side are out of contract at the end of the season, including top scorer Matty Taylor. But the Rovers boss said he would not panic into offering players new deals. "There are a lot of players, when they get a three-year deal, they will sit on the deals," Clarke, 38, told BBC Radio Bristol. "But I do not want to tarnish all players with a bad brush. Tom Lockyer is an example because I could give him a 10-year deal and he would run through a brick wall for me in training and in games. "We have been stung in that environment as a football club in the past," Clarke added. Rovers travel to Dagenham & Redbridge on Saturday on the back of two consecutive league wins. The Daggers beat non-league Whitehawk on Wednesday to secure an FA Cup third-round tie with Everton, but they are yet to win at home in League Two. Dagenham's 40-year-old striker Jamie Cureton will come up against his hometown club, for which he scored 78 goals across a four-year spell from September 1996. "He has looked after his body, he has eaten the right things, he has done it for a substantial amount of time now," added Clarke. "He still looks like a 20-year-old when he is running around the pitch and being very dangerous."